The future is here. Nano-sized entities made of DNA that are able to perform the same kind of logic operations as a silicon-based computer have been introduced into a living animal. 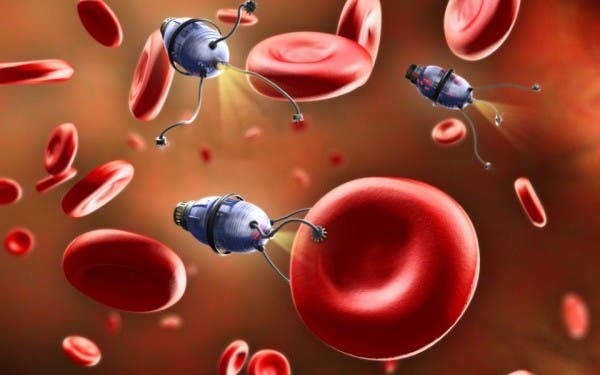 Artistic depiction of nanobots. Via ProTV. It’s every Science Fiction fan’s dream come true. The tiny DNA computers are called origami robots, because they work by folding and unfolding strands of DNA; they travel around the insect’s body and interact with each other, as well as the insect’s cells. When they unfold just like a complex origami, they dispense the drugs which they carry. DNA computing sounds like science fiction, but it’s not exactly a novelty – it’s been researched and developed for over a decade now. DNA computing is a form of computing which uses DNA, biochemistry and molecular biology just like you would use a traditional silicon microprocessor. DNA also has a remarkable property which makes it even more useful for this kind of technique, as it unravels into two complementary strands when it meets a certain protein, making it ideal for delivering substances inside a body. When the molecule opens up, it “delivers the package”. 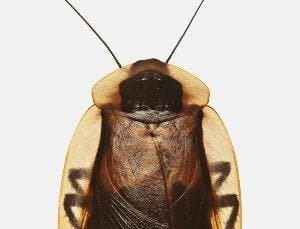 DNA computing nanobots with the same computing power as an 80s computer injected into cockroaches. Simply mindblowing! Image credits: Daly and Newton/Getty Images. Researchers injected different nanobots into cockroaches, labeling them with different fluorescent markers so they can follow and analyze how robot combinations affect where substances are delivered. The accuracy of this technique is similar to that of a computer system. DNA has already been used for storing large amounts of information and circuits for amplifying chemical signals, but when you compare these achievements with the origami robots, they are not that impressive. The number of the nanobots which were successfully used and their impressive accuracy are extremely promising. “The higher the number of robots present, the more complex the decisions and actions that can be achieved. If you reach a certain threshold of capability, you can perform any kind of computation. In this case, we have gone past that threshold,” he says. The team believes they will soon be able to scale up the computing power up to that of an 8-bit computer, equivalent to a computer from the 80s – it may not seem that impressive at a first glance, but remember, this is a computer made from DNA, which serves a very unique purpose, so it’s actually more than enough. The obvious benefits would be cancer treatments, because these must be cell-specific and one of the main problems with current treatments is the lack of cell-targeting. However, the main problem here is that any such treatment has to somehow overcome the immune response delivered by the host. Basically, your immune system will sense the nanobots as a foreign body, and try to fight them. But scientists believe they can overcome even that problem – Bachelet is confident that the team can enhance the robots’ stability so that they can survive in mammals. “There is no reason why preliminary trials on humans can’t start within five years,” he says.